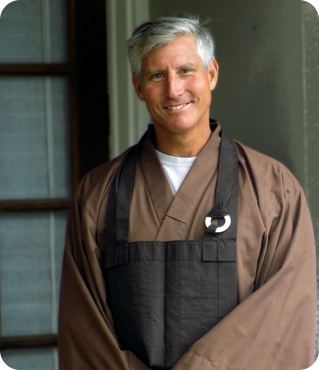 Roshi Lawson Sachter is the Dharma teacher at the Clear Water Zen Center and has been coming to Florida to conduct sesshins and workshops since 1997. Lawson began training with Roshi Philip Kapleau in 1971, and completed his formal study and koan training in the mid 1980s. 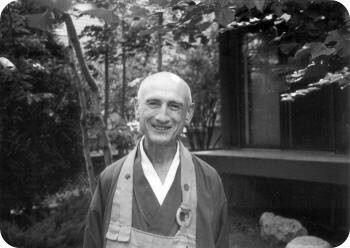 In 1996, Roshi Kapleau sanctioned Lawson to teach, and ordained him as a Zen priest three years later. 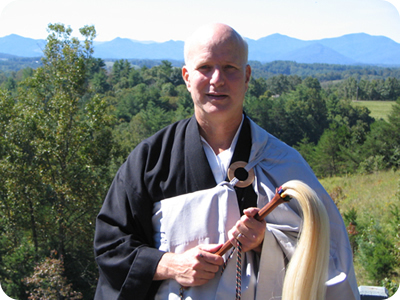 Lawson and his wife, Roshi Sunya Kjolhede, also a dharma heir of Roshi Kapleau, are co-founders of Windhorse Zen Community at Panther Branch, located in Alexander, North Carolina. They have been married for 28 years and are the parents of four grown children. This photo was taken at Panther Branch on September 22, 2004. Lawson-Roshi began his sitting practice in 1969, and has an MFA in photography and an MSW in Buddhist studies. Along with his Zen teaching, Lawson works in private practice as a psychotherapist with training in Dr. Davanloo's Intensive Short-term Dynamic Psychotherapy. 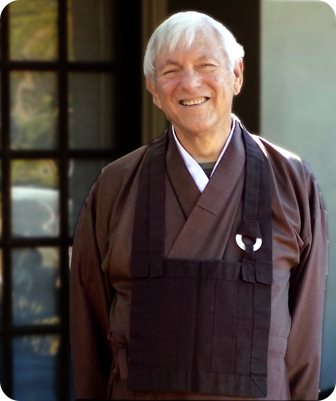 Many of his clients have been Zen practitioners, and this work has done much to shape his understanding of the unique character of Dharma practice in the West. Deeply concerned with the social and environmental crises of the 21st century, Lawson encourages a blending of more traditional forms of training with an engaged Dharma practice - one that embraces family and relationship work, social and environmental activism, and group and intra psychic dynamics. Ken Rosen founded the Clear Water Zen Center in the 1980's and dedicated himself to providing guidance and leadership to our sangha. Our teacher, Roshi Lawson Sachter, installed Ken as Head of Zendo and Dharma Preceptor of the Clear Water Zen Center in 2013, giving Ken authority to work directly with sangha members in daisan and to give dharma talks. Ken began practicing under Roshi Philip Kapleau at the Rochester Zen Center in the early 1970's. Ken was a licensed psychotherapist and his many years of experience in counseling and his decades of dharma training were of immeasurable benefit to the Clear Water Sangha through dharma talks, daisan and life-practice advice. Ken passed away peacefully, surrounded by family, on October 6, 2018. His teachings continue to benefit and inspire the members of our Sangha. Jeff George has been working with Roshi Lawson Sachter since 2010 and Lawson-Roshi has authorized Jeff to give dharma talks and to work one-on-one with sangha members in daisan. Jeff has been a long-time member of the Clear Water Zen Center, serving on the Board of Directors in various capacities and currently as President. Dr. George is also a licensed psychologist and the managing partner of a local therapy practice. Lawson's teacher, Roshi Philip Kapleau (pictured at right, in 1975), was chief Court Reporter for the Nuremberg trials in Germany and served as a Court Reporter as well at the Far Eastern trials in Japan. In 1953 he moved to Japan and spent the next thirteen years undergoing rigorous Zen training. During this time, Kapleau studied with three distinguished Zen Masters, and in 1965 was ordained by Hakuun Yasutani-Roshi, and given permission to teach Zen. In 1966, shortly after the publication of his seminal book, The Three Pillars of Zen, he settled in upstate New York and founded the Rochester Zen Center. For many decades, Philip Kapleau devoted himself to spreading the Dharma in the West, helping to establish affiliate groups in the United States, Canada, Central America, and Europe. His extensive writings include: The Three Pillars of Zen, The Zen of Living and Dying, Zen: Merging of East and West, To Cherish All Life, Awakening to Zen, and Straight to the Heart of Zen. Roshi Kapleau, born in 1912, passed away in the sun-lit garden of the Rochester Zen Center in Rochester, New York, on May 6, 2004, while listening to the chanting of the Heart Sutra.